This is for traditionally published authors particularly of children’s and teenage books, though much will also apply to adult authors. Publishers and authors start from the same place: wanting your book to do as well as it can. But, inevitably and even with the most wonderful publishers and publicists, a publisher simply cannot be as keen as the author for that book to succeed. Publishers have other books to work on and they also have a budget for each book. The budget is not random: it’s based on how many copies they expect to be able to sell. Throwing more budget does not necessarily sell more (or enough more) books. Of course, a vast budget would sell lots of books but not necessarily enough to cover the budget. Publishers also have a marketing plan for your book. That marketing plan has been decided (at least in essence) at the time of acquisition, though circumstances can make it change as publication comes nearer. The marketing plan recognises that some things will work better for this particular book and others won’t. Whether they’ll be pitching you to festivals (and which) and library conferences such as FCBG and SLA/YLG. (Remember, those festivals and conferences may very well say no! They have programmes and themes to fill.) If they aren’t pitching you for the big ones, discuss the smaller ones. And don’t be upset if they don’t pitch you for any/many: festivals are not always the best use of time and money. You don’t want to rock up to a festival and find a tiny audience. Better to stay at home chatting to readers online! ge they’ll be hoping for – this requires you to have some topical or newsworthy angles to write about. Suggest ideas yourself. Social media promotions and giveaways? Very low-cost. Any specific gimmicky ideas related to your book? For my novel Deathwatch, I organised a world-record-setting Deathwatch Dash, involving SIX separate school visits, each of an hour, in one school day. School events/tour? It’s normal (but not essential) to do a small number of unpaid events around publication, either in a bookshop or, more usefully, in schools. But you can organise this yourself and sometimes it’s better to. That way, you’ll get a programme you can manage. But if your publisher would like to organise something, I’d go for it, as long as they will focus on schools/bookshops with a good book-selling record and as long as it’s super-organised. Don’t do too much, though – it’s exhausting. Launch party or event? Do not expect a launch party! They don’t usually influence book sales so are not cost effective. But they can be fun. Most often these are organised by the author, though very often a publisher will put some money to it or sometimes, if yours is a pretty commercial book, even pay for it and organise it. Remember that every book is different and good publishers are selective about what they do but the above ideas are very common. Expect something but not too much. If you suggest something and they say no they should explain why. If you come up with a good idea and it’s within budget, there’s a good chance they’ll support it. Remember that not everything will work for every book. Just because another author had posters on the Underground doesn’t mean that would be right or sensible for your book. So don’t go around feeling let down because a friend had something you didn’t have. What are your skills? What things are you expert in? Your contacts? Your relevant background? Can you do public-speaking? Are you nervous about this? Do you want some help? 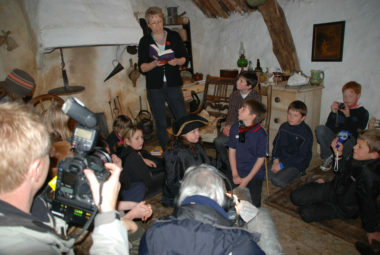 Can you organise your own school events, if you want to do them? OR do you need help and contacts? What about hiring your own publicist? Crucially, discuss openly with your publisher. If it’s for a particular book, your publisher will be understandably wary as this may well encroach on their plans. The publisher must come first in the promotion of your book. BUT it’s not unknown for authors to hire freelance publicists for general publicity work (I have done so) outside the publication window for that book. If you do this, keep your publishers fully informed and never tread on toes. Make it teamwork. I’ve had great success with this. In fact, one of my former freelance publicists is now my publicist at Hachette! Don’t be ripped off. There are outfits that will sell you a promotion package but they may have no experience of the sort of book yours is or how to work with a traditional publisher. Make it time-limited or target-based. Choose someone who has worked in traditional publishing. Keep an eye on what was agreed and what is happening. Publicity departments will be working to a schedule so don’t hassle but it’s fine to remind. Don’t expect anything exciting to happen on publication day itself. It’s just a date! Often nothing happens. Your book has hundreds more days in which to sell. Join the Scattered Authors Society (for published UK children’s authors). We have a Facebook group and we discuss what works and what doesn’t. Don’t use a scatter-gun approach. You don’t have to be on Twitter AND Facebook AND Instagram AND have a website. You don’t HAVE to do loads of school events. Or any. Do what suits your personality, life, energy, skills. Ask for some extra free copies to use as giveaways. Use them carefully. Keep your website up to date. And your social media accounts if you have them. Remember that you are the author but ALSO part of a team. Say thank you often. And well done. And please. 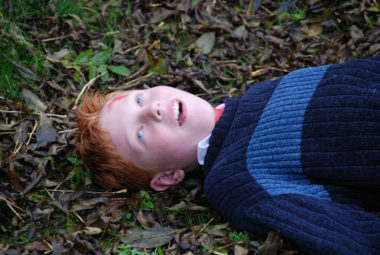 Last resort: for the purposes of great TV for your launch, find a child who will pretend to be unconscious. Remember: just because X did or didn’t work for someone else doesn’t mean it will or won’t for you. Don’t measure and compare: just do your best for your book and work as well as possible with your publisher. And eat chocolate. 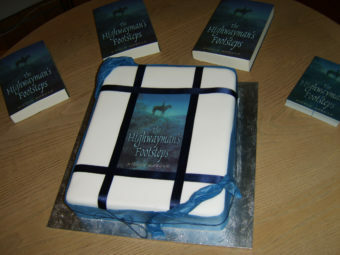 OH – and, if you’re having a launch, have a book CAKE! I’m sure I’ve forgotten lots of things. Do add comments and ask questions. Wonderful, energetic advice. I thank you! I love the book cake! Thank you for taking the time to write this. Very helpful. I was looking for the section on promoting your book even if you have a publisher. I’ve been contacted by a promotions company for a 50% discount so I was looking for advice. Apologies if i’m being dense but I don’t understand – are you saying you didn’t find what you were looking for? The whole piece was about promoting your book when you have a publisher. Your question (about the promotions company) suggests you don’t have a publisher.(?) If you do, you can’t take on a promotion company without discussing it with them and they aren’t likely to be very happy about it as it would probably become awkward and messy. If you’re self-publishing, you might well need to pay for help with promotion but make sure you know what you’re paying for and that they have a good record. I can’t advise further as it’s not my interest.